There are numerous ways to learn about SCC's Social Equity Campaign and the Community Investment Tax Credit program this fall, while having some fun mingling with Somerville neighbors across the city. 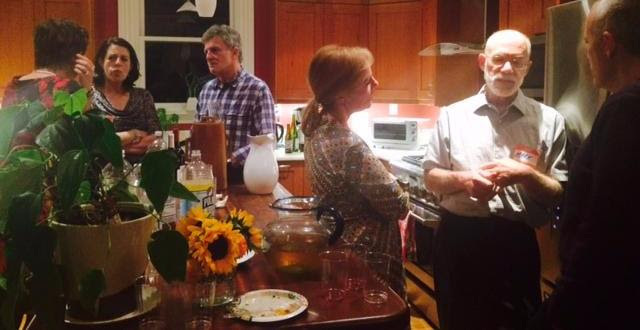 Over the past month, Nancy Bernhard and Bill and Carolyn Taylor graciously hosted House Parties to help us raise money toward our 2015 Social Equity goal of $300,000! These have been wonderful events to bring the community together interested in making an impact in Somerville. This past week, on October 20th, we hosted an information session for CPAs and financial planners to learn more about the mechanics of CITC, and how this can be a great tool for their clients. Presenters included Joe Kriesberg, President of the Massachusetts Association of Community Development Corporations (MACDC); Matt Troiano of AAFCPAs: and Mark Goldberg, CPA. To date, we have a raised a total of $97,000 in cash and pledges toward our goal of $300,000! There is still work to be done, and you can help us while having fun along the way. Mark your calendars for a "Social Equity Social" at Thalia Tringo's, 128 Willow Avenue, onNovember 10th, 6:30-8pm. Bring your neighbors and friends! If you are interested in participating in any of these events, please be in touch. If you can't join us at one of our gatherings, we are always appreciative of individual gifts. Every contribution makes a huge impact in moving us closer to our social equity goals for Somerville. Let's keep Somerville diverse and affordable!